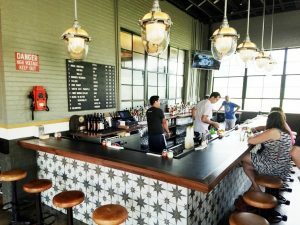 Changes over at Rocky Top Hospitality has led to a smaller group of restaurants being led by their management team: Dean’s Seafood Bar and Grill, Twisted Fork and the Daily Planet Cafe. 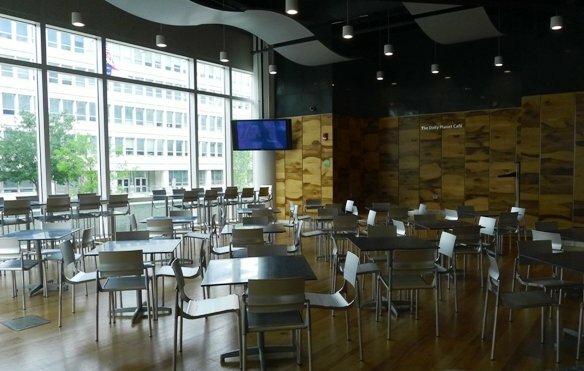 Over the long holiday weekend, I finally decide to take a quick visit to the Daily Planet Cafe which is located in the same area as the NC Museum of Natural Sciences. 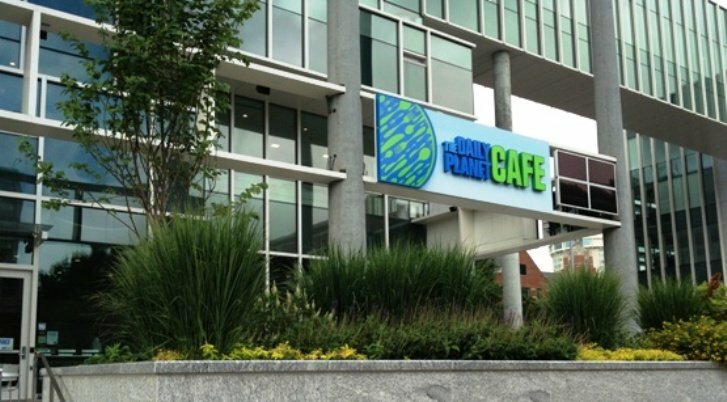 Out front, the Daily Planet Cafe has a large open patio, inside it opens up to a large modern interior but keeps things pretty simple with a order and pick-up at the counter system. As with most museum cafe’s, the Daily Planet has a pretty basic menu that’s meant to please young families and kids. A small menu of breakfast options (eggs, meat, grits, hash, french toast) along with some sandwiches, salads and wraps for lunch. I order up a 4-item breakfast plate ($9) along with a cup of coffee which puts me at about $11. I get a buzzer, head over to the coffee bar and sit tight. The Daily Planet is mostly self-serve for your drinks, cutlery, napkins and such so it’s a super casual spot. But the inside is quite nice, open and airy and the coffee’s very good! About 10 minutes later, my buzzer goes off and it’s time to grab my breakfast tray. 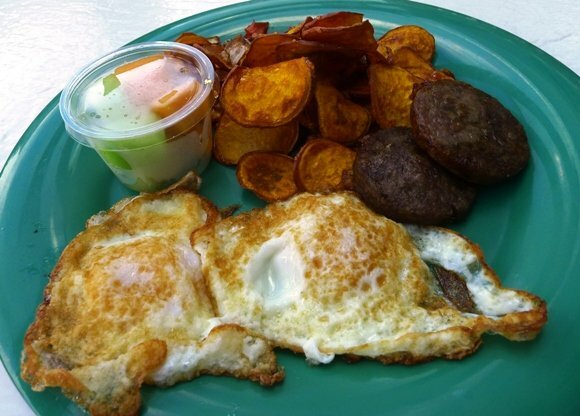 A nice plate with two perfectly cooked eggs, a small cup of fruit, sweet potato slices and sausage patties. It’s a solid breakfast and some items to take note. The sweet potato hash is nearly like sweet potato chips with sauteed peppers and onions along with a dash of syrup. Interesting and different, I imagine little kids (and me) really enjoy this combo! The sausage and fruit were fine, nothing special but I admit to preferring sausage links. 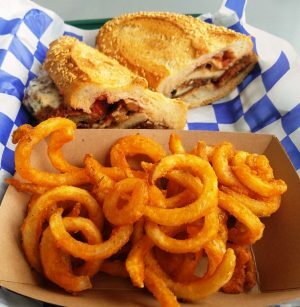 The patio is a great covered spot for an outdoor meal so Daily Planet Cafe is an interesting dining alternative in this hood. Perfect if you’re visiting either of the two museums here but I’ll have to come back for their lunch menu since breakfast fell into the it’s just OK category. But after breakfast, a trip the the NC Museum of History rocked it out! 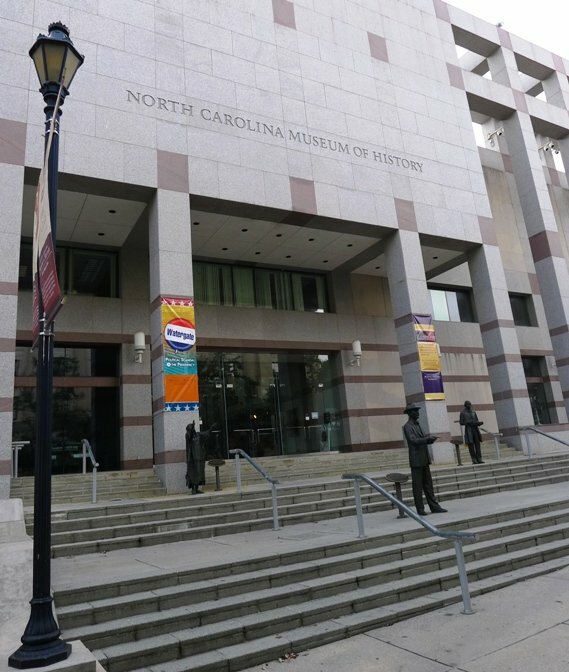 Open to the public with no entry fee, it houses a large exhibition of NC history through the years. Covering everything back to pre-European settlement, you wind your way through Sir Walter Raleigh, Blackbeard, slavery, native-American re-settlement, the Civil War, Depression WWII and more. 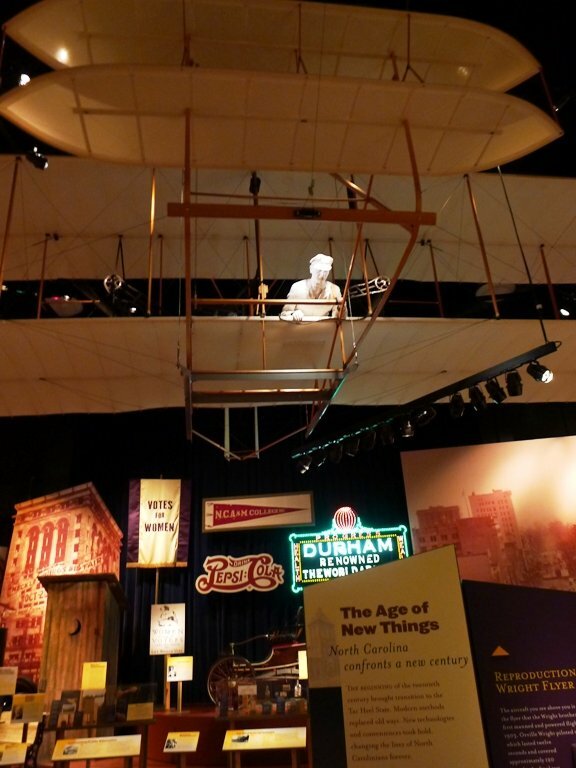 It’s an impressive display of items and stories that every North Carolinian should visit at one point and time. And it really sets the back-drop for where the state is today. 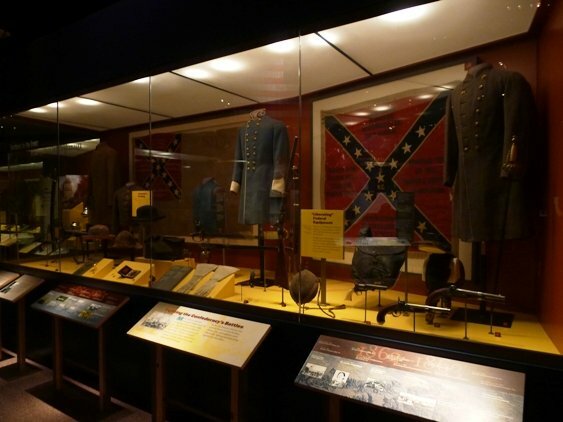 Further upstairs are displays on NC sports history, more wartime memorabilia along with a clay pottery exhibit. I’ll have to come back with more time to really absorb the place. All in all you can’t go wrong with a visit to the Daily Planet Cafe, NC Museum of History and NC Museum of Natural Sciences! 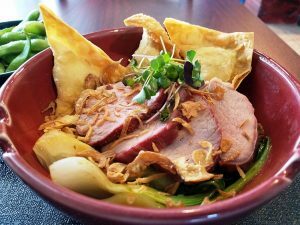 Just north of the state capital, these wonderful spots can make for a great 1/2 day visit and you can do it all on a budget. Good food, great history and knowledge can be had if you just make a bit of an effort. So come on down for a visit!